In Contraception and Abortion from the Ancient World to the Renaissance, John Riddle showed, through extraordinary scholarly sleuthing, that women from ancient Egyptian times to the fifteenth century had relied on an extensive pharmacopoeia of herbal abortifacients and contraceptives to regulate fertility. 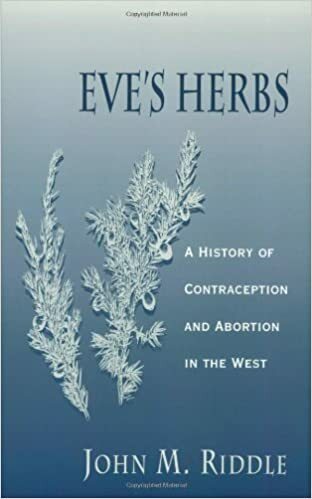 In Eve’s Herbs, Riddle explores a new question: If women once had access to effective means of birth control, why was this knowledge lost to them in modern times? Beginning with the testimony of a young woman brought before the Inquisition in France in 1320, Riddle asks what women knew about regulating fertility with herbs and shows how the new intellectual, religious, and legal climate of the early modern period tended to cast suspicion on women who employed “secret knowledge” to terminate or prevent pregnancy. Knowledge of the menstrual-regulating qualities of rue, pennyroyal, and other herbs was widespread through succeeding centuries among herbalists, apothecaries, doctors, and laywomen themselves, even as theologians and legal scholars began advancing the idea that the fetus was fully human from the moment of conception. Drawing on previously unavailable material, Riddle reaches a startling conclusion: while it did not persist in a form that was available to most women, ancient knowledge about herbs was not lost in modern times but survived in coded form. Persecuted as “witchcraft” in centuries past and prosecuted as a crime in our own time, the control of fertility by “Eve’s herbs” has been practiced by Western women since ancient times.